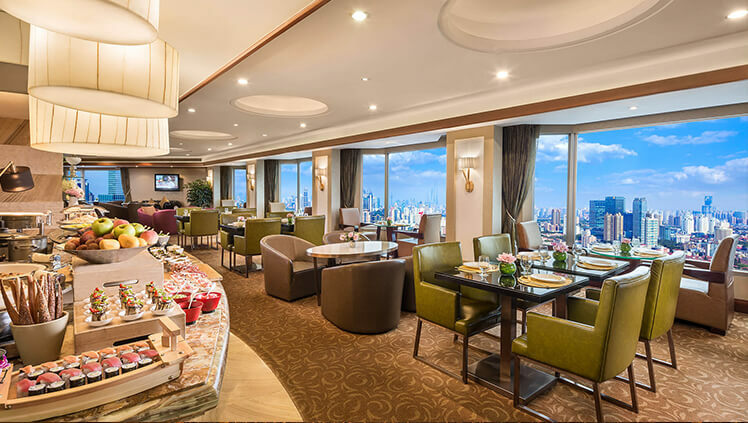 Our Executive Lounge is located on the 38th floor, and is one of the largest in Shanghai, offering stunning panoramic views across the city. This is the perfect quiet location to meet or relax, while our dedicated service team is on hand to cater to your needs and comfort at all times. Executive Deluxe Rooms are located on 31st-38th floors. Guests can enjoy the comfort of these rooms with additional benefits. Complete with high speed wifi and working area for business travelers. All rooms include new 49 inch digital signal TV. Guest staying in these rooms may enjoy turndown service and Executive Lounge access. Also includes private check in and out, plus Breakfast/Afternoon Tea/Evening Cocktails and snacks. Complimentary pressing (1 suit per stay) and 2 hours complimentary use of meeting room per stay (subject to availability). Executive Grand Premier Panorama Rooms are located on 31st-38th floors. Stunning city views can be enjoyed with extra -large windows with natural light, and separate seating area with sofa for relaxation. Guests can enjoy the comfort of these rooms with additional benefits. Complete with high speed wifi and working area for business travelers. All rooms include new 49 inch digital signal TV. Guest staying in these rooms may enjoy turndown service and Executive Lounge access. Also includes private check in and out, plus Breakfast/Afternoon Tea/Evening Cocktails and snacks. Complimentary pressing (1 suit per stay) 2 hours complimentary use of meeting room per stay (subject to availability). 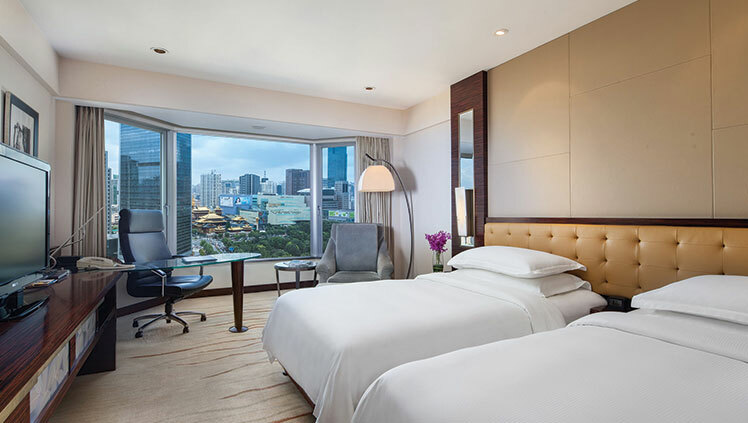 Enjoy the comfort of one of our spacious Panorama Suites which feature a large bedroom, separate sitting area and additionally offer fantastic views of the Shanghai skyline. For additional convenience, these rooms have two stylish bathrooms. Complete with high speed wifi and working area with printer for business travelers. All rooms include new 49 inch digital signal TV and audio system. The hotel's Deluxe Suites each feature an elegantly furnished bedroom with walk-in closet, a beautiful living room, dining room and study with high speed wifi and printer. The unique design of the bathroom includes an additional double vanity area. Additional features include an audio system and new 49 inch digital signal TV. Guest staying in these suites may enjoy turndown service and Executive lounge access. Also includes private check in and out, plus Breakfast/Afternoon Tea/Evening Cocktails and snacks. Complimentary pressing (1 suit per stay) 2 hours complimentary use of meeting room per stay (subject to availability). This expansive Presidential Suite, located on the 37th floor, offers panoramic views of the Shanghai cityscape from its large windows. The suite also features one king bed, a separate living room, spacious dining area and kitchen, plus a large work desk with printer, and high speed wifi. Additional features include an audio system and new 49 inch digital signal TV. 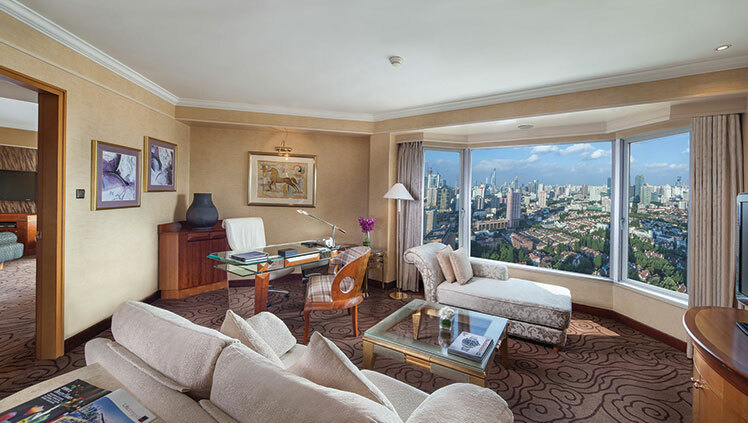 Guest staying in the Presidential Suite may enjoy turndown service and Executive lounge access. Also includes private check in and out, plus Breakfast/Afternoon Tea/Evening Cocktails and snacks. Complimentary pressing (1 suit per stay) 2 hours complimentary use of meeting room per stay (subject to availability).